FOOTBALL: TEENAGE striker Jodi Jones revealed Saturday’s win at Lincoln City was a ‘graft’. 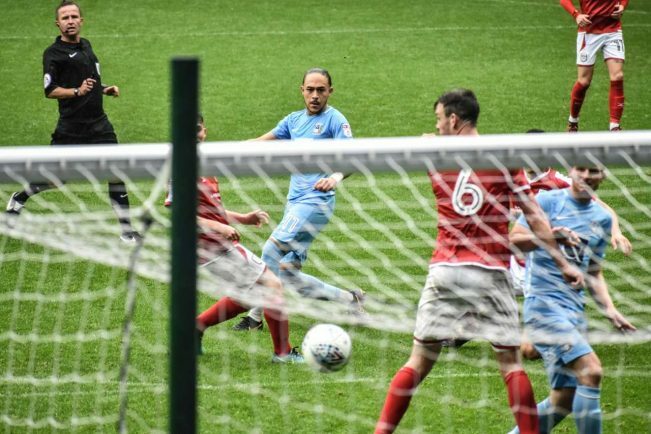 The former Dagenham and Redbridge contributed one of the Sky Blues’ two goals as City came from a goal down to beat Lincoln 2-1 in front of a capacity crowd. It was Jones’ fourth league goal this season, and the forward said Saturday’s win was the result of a team performance. He said: “We did really well as a team and going a goal down isn’t easy. “I saw their goalkeeper’s name on the team sheet before the start of the game – one of the first times I got called up to the Dagenham and Redbridge Reserves I scored past him. “I was thinking I was going to score past him again, and I did. “It was a great ball from Jordan (Shipley) – I broke my back to get to it and it’s gone a bit wide but I’ve come inside and shaped it up. Jones was not only full of praise for the team, but also the travelling supporters – all 1,460 of them. “Our fans are amazing they do their best every week,” he said.